Thinking one step further. Exploring new paths. Questioning things with open eyes: Three sentences that put the philosophy of Bernd Benninghoff in a nutshell. With the BB 11, BB 31 table and the BB 21 Strap shelving system, Bernd Benninghoff has created furniture for Janua to date. The table BB 11 is composed of individual wood lamellae held together by two adjustable buckles made of flat steel. 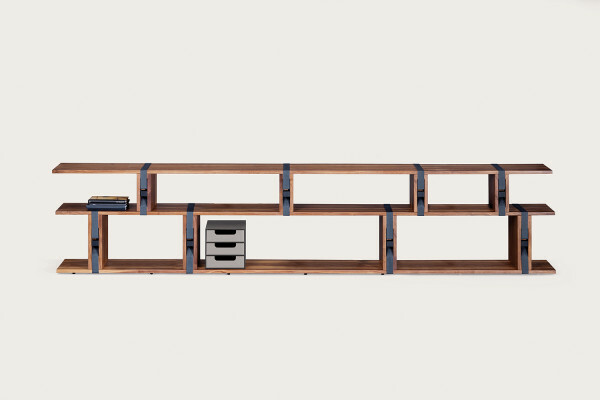 The BB 21 Strap shelf is as ingenious as it is simply impressive: The tailor-made shelves are friction-locked with an innovative belt system. An idea that Bernd Benninghoff had in a moment when everything was standing still. In a traffic jam on the motorway. Since 2007, Bernd Benninghoff has been teaching design as Professor of Furniture and Interior Design at the University of Applied Sciences in Mainz. With his innovative mindset, he has developed and redefined the design of Janua - we are looking forward to his next ideas.